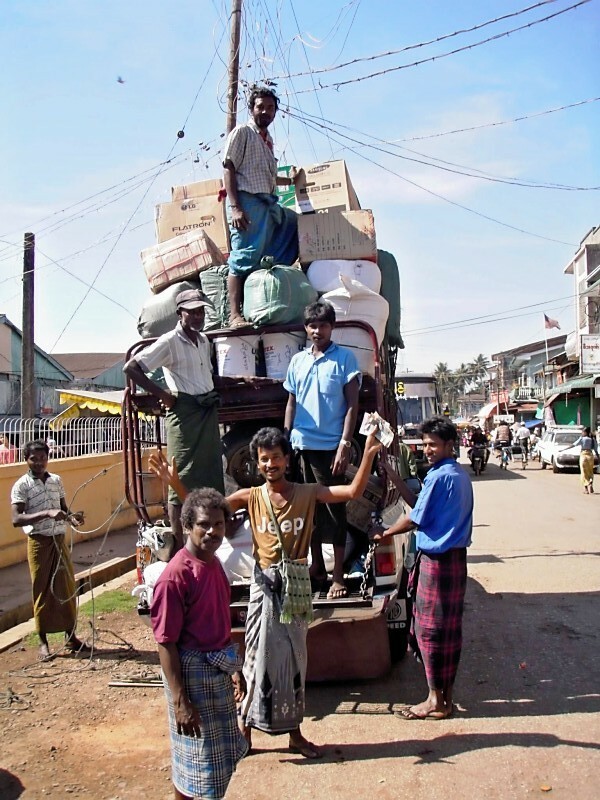 Myanmar and Burma: Overlapping experiences of the same land | What moves you? Myanmar. Burma. This land is two separate places. Myanmar is the place where the government has fixed an unrealistic exchange rate, so we must purchase bundles of 1000 kyat notes on the street, counting each stack and griping over every tear or hole. The only travel for us is on expensive buses with obnoxious music videos on continuous loop, no other transportation allowed for foreigners. Government checkpoints at the entrances to touristic zones demand US dollars for passage; faded or folded bills are rejected firmly. We are forbidden from straying from these areas; our bus windows look out on empty, dry scrublands as we are shuttled to the next town with guest houses licensed to admit foreigners. This forces me into a pattern of travel that makes me one of thousands of white faces, understandably encouraging some locals along the way to see the dollars in my pocket as the first and foremost reason to engage. I can’t speak with them about the real issues on my mind, the political issues that could be dangerous for them to acknowledge. To a certain degree, I see what I am allowed to see and I say what I am allowed to say. My voice and vision are constructed and deformed by tyrannical forces. Yet, simultaneously, I encounter the second, contrasting world that balances the restrictions and suppression. The land of Burma has magic to it. 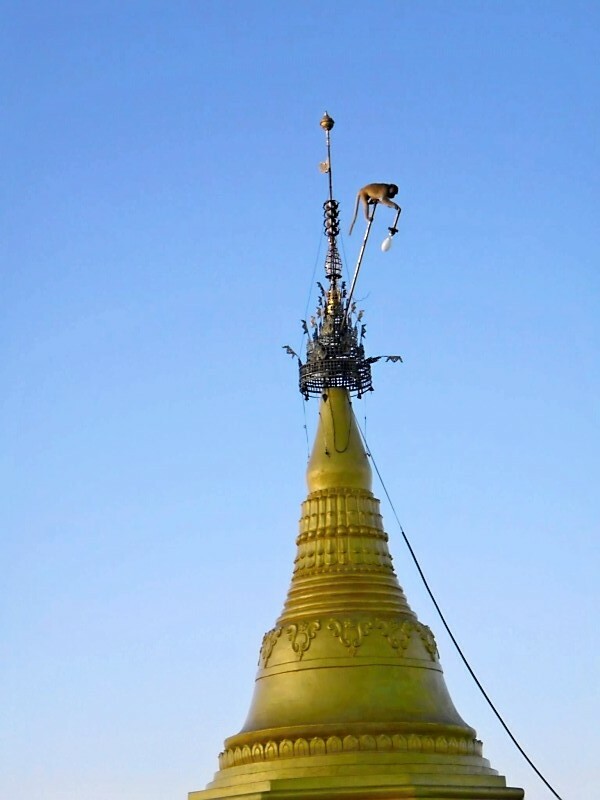 The southern countryside is dotted with gold-crowned pagodas and monasteries looking down from every hilltop. Here, Buddha statues peek from deep inside caves, and striking geological features, like stone abutments and giant boulders, are consecrated with their own pagodas perched like party hats. People smile and live their lives for their own purposes rather than for my consumption. Women’s faces are painted with a clay-like wood pulp not for tourist photo opps, but because it blocks the sun and soothes the skin. I am awakened at 5 am by the bell of the monks that filter through the streets collecting alms in the early morning gloom. The nighttime alleyways of old Yangon are crowded with tea shops and meat-on-a-stick joints that attract locals in droves. In this magical place, I can go to Bagan in the northwest, walk into one of the forgotten temples dotting the plains, and scramble through a maze of 900 year old passageways strewn with crumbling Buddha statues. 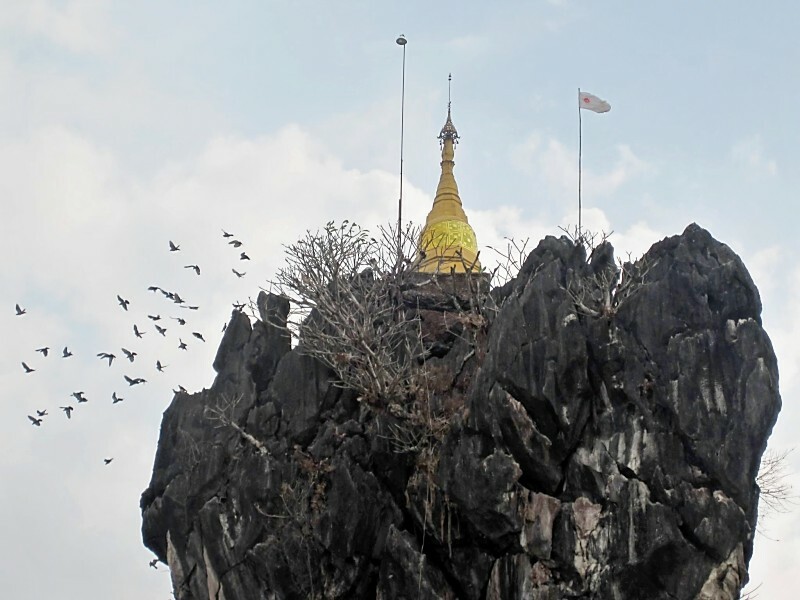 Or, in the south, a steep climb up a limestone karst leads to a monastery ruled by monkeys, surrounded by vertical drops of 700 meters to the rice patty plain below. This magic is why I traveled here. It is not just the thrill of discovery, the masculine, colonial fantasy of being the first white man to visit virgin territory. Catching myself in this myth, I recoil. Rather, it is about finding surroundings that encourage interaction and play, improvisation. What I dislike about the tourist circuit as a framework is that it confines my ability to play, to choose my own adventure. When I get to a place like Bagan, I want the imagination to awaken. This is the power of Burma, when it transcends the restrictions of Myanmar. I want to wheel my bike onto any dirt path of my choosing and find myself face to face with a Buddha in an ancient sanctuary of stone. I love the photos and the contradictions are so intriguing! Sounds like my kind of place, full of paradoxes. Definitely my type of place too, though I suspect I might end up in some trouble with the authorities for doing or saying the wrong thing. Very fine writing in this one Caleb. Submit some of these to travel mags or elsewhere. The big problem is that it isn’t you, but rather the local person whose hotel you stayed at, who you were talking to, who invited you for dinner, etc. that gets in trouble with the authorities when the foreigner acts out. Its a pretty ingenious way that the govt is preventing meaningful discourse. In many ways, the strive for let one’s thoughts let pass(sounds good in German, maybe not in your language!) grows only stronger in a country that suffers under an oppressive, utterly incompetent government. This strive can take forms of violent rebellion. Peace and war and go together like a horse and carriage, as Frank Sinatra once sung. Burma is another example for this historical fact that has accompanied many other countries. 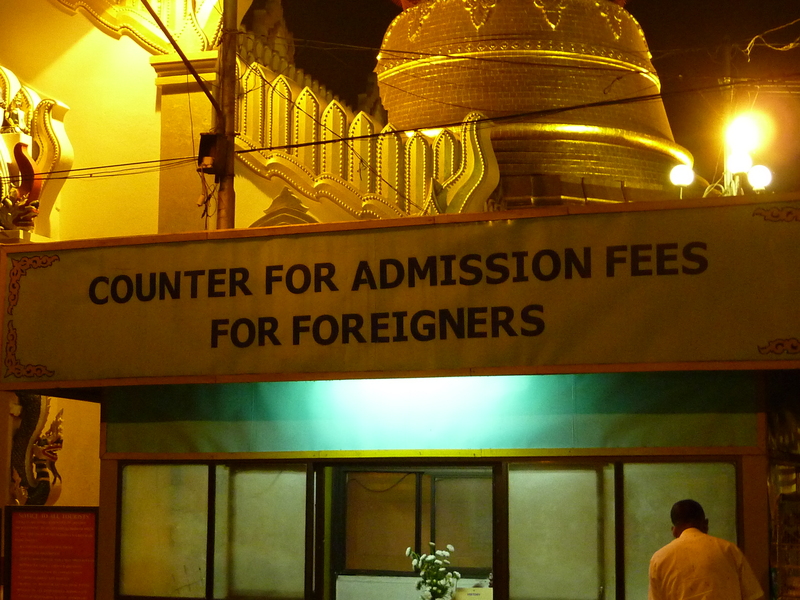 The strive for speaking one’s mind in Burma has often surprised me. I remember meeting a NLD member, openly showing the picture of Daw Aung San Suu Kyi, in the middle of Hpa.an back in 2001. There was no fear to speak one’s mind. I have, through my work in 2001, met countless security detainees who paid a heavy price for having spoken their mind. On other hand, in the same prisons, I have met prison officials who urged us to pass on unacceptable things in the prisons that I visited on the desks of their superiors because they could not do it themselves, as they would risk the pension for their families. Speaking one’s mind even in such a country is not impossible. But it deserves courage that I can hardly imagine. Imagine, you and I as visitors feel oppressed by this system and try to venture out of the official tracks. Imagine how the people who pass their life here must feel. Indeed, when going to such countries like Burma, I also learn to appreciate the amazing freedom we actually have to chose our own adventures, as you say. It was great seeing you with Michelle, Sabrina and Ryan. I look forward to reading more of your thoughtful insights when touring through South East Asia. Marcus, thanks for taking the time to read closely and to comment thoughtfully. As you point out, the impact of the government is on a whole different order of magnitude when we start comparing the experience of the traveler to that of the Burmese living under it. Michele and I had a few conversations about the possibly devastating impact that generations of repression can have on the artistic drive of the people to voice alternative perspectives, even outside of the political realm. 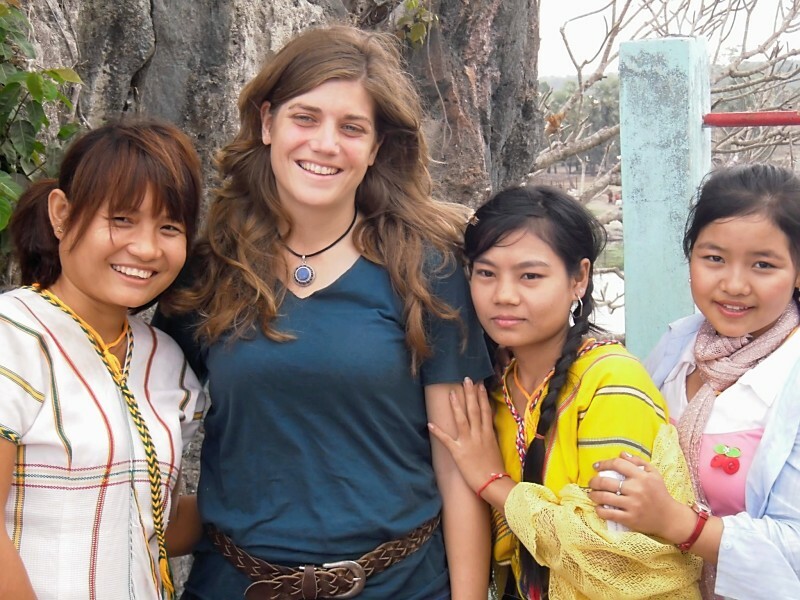 I wonder if you had much experience interacting with artists or musicians in Burma? Thanks again for reading, and of course for meeting us in Thailand!